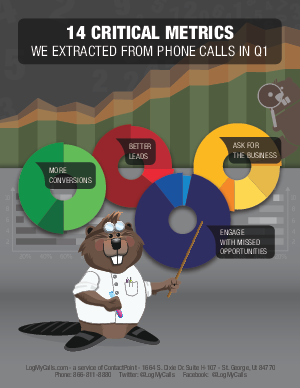 In Q1, millions of call segments were processed by the LogMyCalls Conversation Analytics engine. These calls were from dozens of industries across North America. The analytics engine extracts data from calls like lead score, conversion rates, and missed opportunities. Conversation Analytics extracts all of this data based on the words and phrases said by both the agent and caller on the phone call itself. This White Paper is a report of the 14 Critical Metrics We Extracted from Phone Calls in Q1.